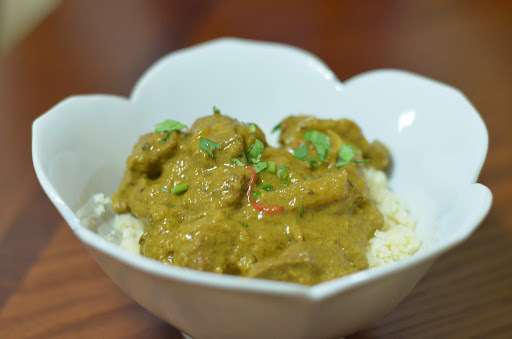 We worked on this recipe partially out of our love for curry and other similar cuisines, but also because we had 2 lbs of bison stew meat in the freezer that was ripe for cooking. This stew looked especially inviting, and we are pleased with the results. 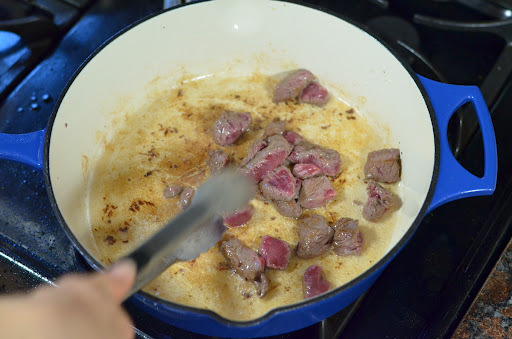 It’s worth mentioning that bison is much leaner than the meat that would typically be used in this dish (lamb), so if you don’t have bison, you might add a little time to the whole process. I also have to give a special shout-out to The Domestic Man who helped me stay accurate with my naming of this dish. If you aren’t aware of Russ, you should take a moment and check out his work. His recipes are delicious and well referenced to be culturally accurate. Plus, he takes awesome pictures and helped me find the glory that is a 50mm lens. 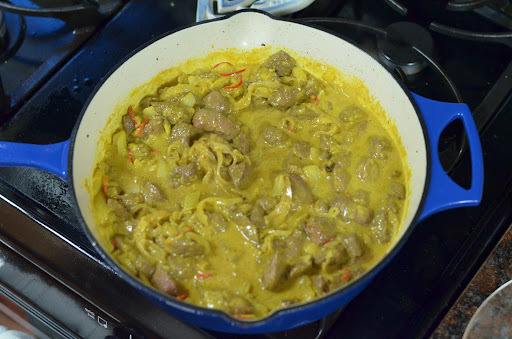 After melting coconut oil in skillet on medium-high heat, quickly sear stew meat. This will happen quicker than you expect, so keep a close an eye on it. 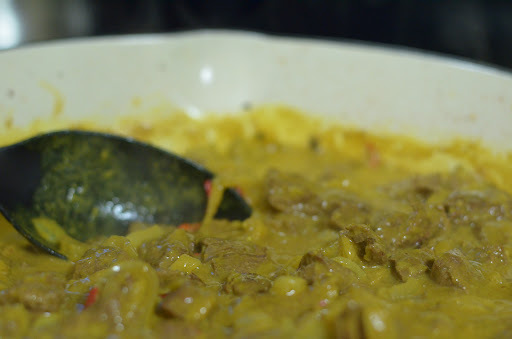 Place meat aside, and then quickly brown the thinly sliced onion and set aside with the meat. 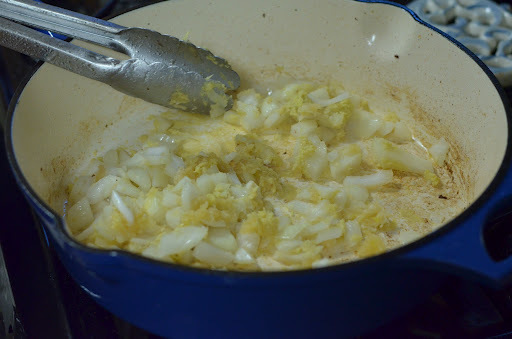 Add garlic, ginger, and diced onion to the pan and cook until ginger and garlic are fragrant and onion translucent. Stir frequently–this takes about 5 minutes. 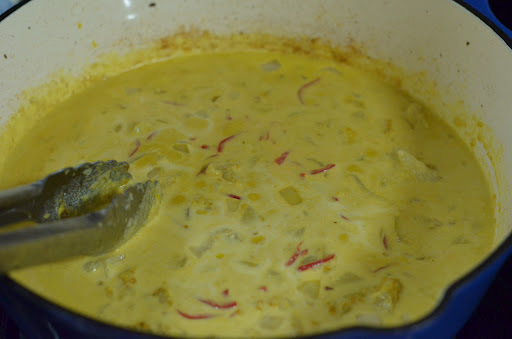 Next add in chili and tumeric to sauté quickly (no more than a minute) and then add coconut milk and coconut aminos. 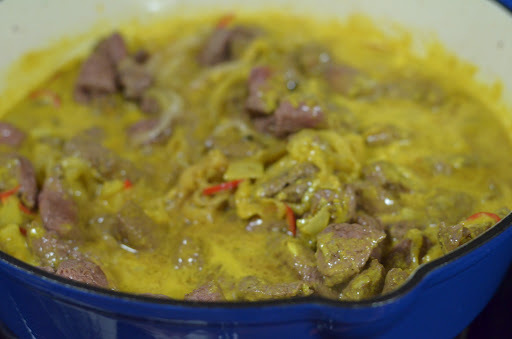 Return the meat and onions to the mixture, and simmer for 40 minutes. Be sure to stir regularly and make sure that the simmer hasn’t gone out of control. Serve up and enjoy! While not terribly spicy (next time I plan to double the red chili), this was a hearty meal with flavors unlike our traditional fare. The change of pace was definitely welcome. We’ll have to do more of this in the future. Enjoy! We had this over a bed of cauliflower rice, but there’s no reason you couldn’t have it on its own. And don’t forget to follow us on Facebook, Twitter, and Google+ for all the latest! 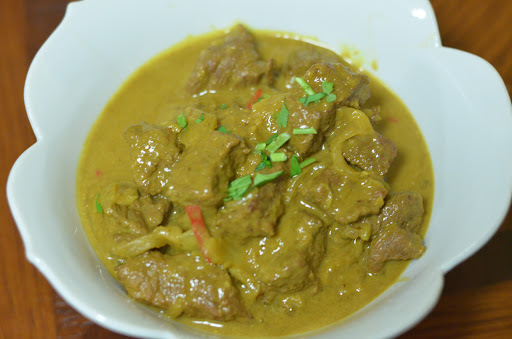 Wow, would you mind sharing this recipe on FastPaleo.com? This looks fantastic!! With almost 30,000 followers on our Facebook page, we will publish each uploaded recipe and link back to your blog, thus creating lots of traffic for you! !I love this recipe!! But I'd love for all of your recipes to show up over there! 😉 http://fastpaleo.com/upload-a-recipe/THANK YOU! !